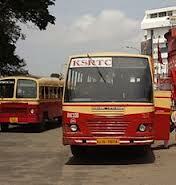 22nd November, 2012:Kerala State Road Transport Corporation (KSRTC) will introduce real-time booking of its long distance buses. Currently tickets can only be booked from the starting station and the vacant seats cannot be filled after the start of the bus. The service will be made available with the help of electronic ticket machines which would have the technology to inform the number of vacant seats to the server. This a passenger can reserve ticket from Kollam in a bus from Trivandrum to Ernakulam after checking the availability of vacant seats any time before the bus reaches Kollam.